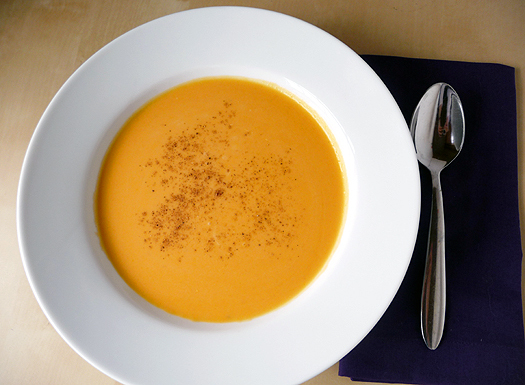 I make a mean Butternut squash soup and I have tried to write down my “so-called” recipe. But when you write the way you cook it sounds like this…..
Peel and chop up squash, roast it , oh wait toss it with EVOO and a little salt, then roast it. Oh and along with the squash roast a small sweet onion, a couple of smallish carrots, a sweet potato and a couple of apples. No garlic, yes I know your thinking WHAT! She puts garlic in everything. But really, it just doesnt work in this soup, the garlic over powers the squash. Maybe some day I will try it will a mild, roasted, sweet elephant garlic but until then leave it out. Trust me. So the stuff roasts until, well …when it’s done. When the veggies are golden brown and have rendered some sweet veggie sugars into the bottom of the pan. OH WAIT, go back. Before you put the veggies in the oven, line your roasting pan with foil. As I was saying, when the veggies are fork tender put them into a soup pot with just enough veggie broth to barely cover the top of the squash. Use a little of the broth to deglaze the roasting pan of all the veggie goodness. Set your stove on medium heat and get out your immersion blender. Blend to your little hearts content. Sometimes I like my soup creamy and sometimes I like it with more texture, it is all up to you and your taste buds. You have an immersion blender right? Well if you don’t you can just put the veggies in a blender, in batches, and wrrrrrrr away until they are smooth adding just enough broth to make it easier to blend, add it all back to the soup pot. Voila! Soup! Add salt and white pepper to taste. To serve it sprinkle the top with a little curry powder or cayenne pepper. Maybe swirl in some sour cream, Creme fraiche or greek yogurt. You can also top it with fresh herbs. This goes great with a side salad of autumn greens top with slivered almonds and garlic cheese toast on the side. You know I had to bring garlic to the table somehow. What kind of cheese toast you ask? Well how about a nice mild camembert or creamy goat cheese, lightly browned under the broiler. There you go, a great vegetarian (vegan if you leave out the cheese and wrrrr some garbanzo beans into the soup, but thats another post) dinner or lunch, heck I’d eat it anytime YUM. You Might be a yoga geek if….